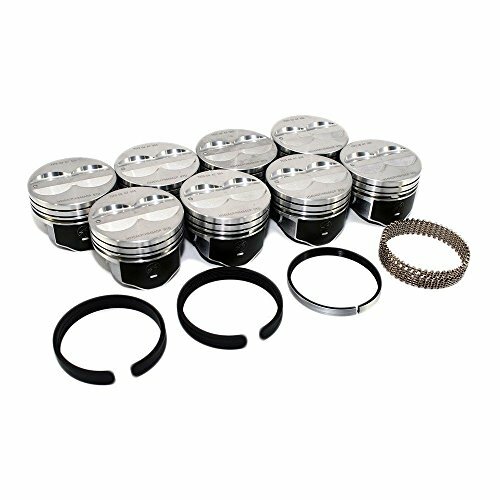 This listing is for a set of sealed Power Hypereutectic coated skirt pistons and a matching MOLY Perfect Circle or Hastings ring set for 350 Chevy small blocks1968-2000. H617CP- 030 size 4.030" bore with .275" (11.8cc) DOME tops.Good for street/strip or light race. 5/64" 5/64" 3/16" ring grooves .927" pin diam. for 5.7" rods 3.480" stroke. PRESS or FLOAT pins included. Locks for floating pins not included!! Locks for floating pins not included!! 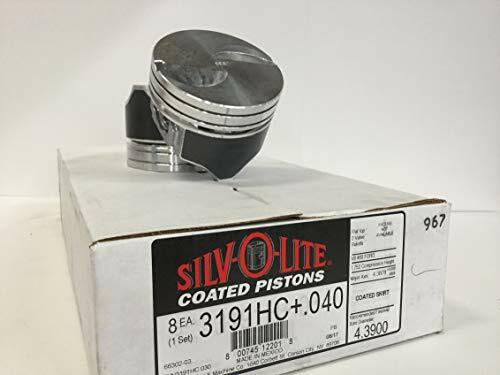 This listing is for a set of (8) Flat head w/2-valve relief Coated skirt piston from Silvolite Pistons. 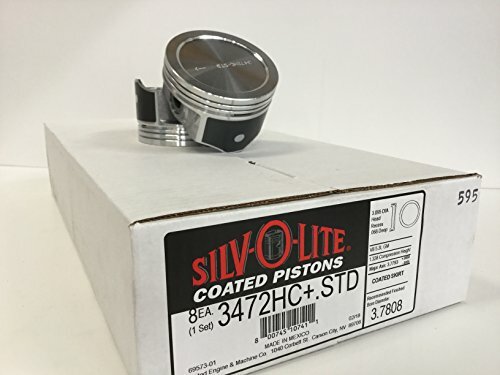 Silvolite has been making pistons since 1922. This set is +.040" Over Bore and fit early model 1972-1990 Ford 460 V-8 - 4.400" bore diameter. These can be used in Mercruiser boat engines equipped with the Ford 460 engine. These are Not OE duplicate pistons. 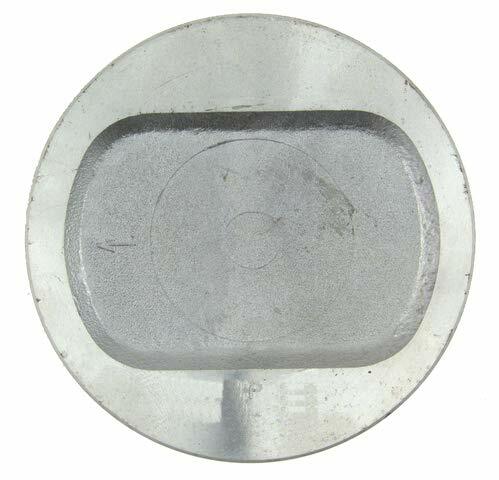 These replace the Oblong Oval recessed OE pistons.Use these as a performance upgrade. Use in sets only. Compression distance: 1.752". Ring grooves 5/64" 5/64" 3/16". Pins included 1.040" pin diameter-Press-fit only. For stock 6.605" length rods. Stock 3.850" stroke. This listing is for a set of (8) Speed Pro Chevy 1967-1990 350 BASED engine (4.030 bore x 3.480 Stroke) Hypereutectic Flat Top w/ 4 valve reliefs pistons & matching Hastings or Perfect Circle Rings depending on availability at time of purchase and Lock ring clips for floating pins!!! Ring dimensions 5/64, 5/64, 3/16. Accommodates pressed or floating wrist pin installation. 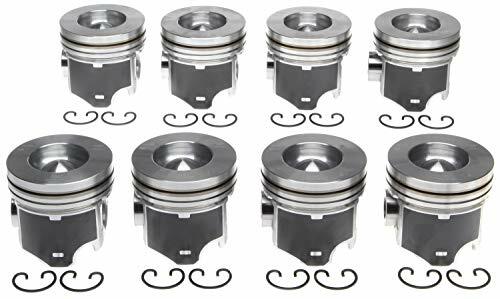 Speed Proset of (8) Hypereutectic Coated Skirt Pistons+Moly Hastings or Mahle Rings for Chevrolet 400ci small block V-8 1970-80 - 4.185" bore (at .060" Over Size). 5/64" 5/64" 3/16" ring grooves. For Stock 5.565" length rods, Stock 3.750" stroke, Press-fit only Pins. "Hypereutectic. Piston made w/high strength alloy &silicon for excellent strength & scuff resistance. This advance combination allows tighter bore and improves sealing for less blow-by. Higher strength than cast, designed to retain standard ring gaps in top groove.. DUROSHIELD? skirt coated piston. Moly-graphite coating, Extends engine life; Reduces friction for higher fuel economy and prevents damage from inadequate lubrication on start-up; Eliminates scuffing and wear; Helps improve cylinder sealing for less blow-by. " Chevy 7.4/454 Speed Pro Hypereutectic .340" Dome Pistons+MOLY Rings Set/Kit +.040. Chevrolet 454 - 4.290" bore (at +.040" bore). .340" Domed head w/2-valve reliefs. DurOshield skirt coated piston. For stock length 6.135" rods and Stock 4.000" stroke. Press-fit or floating. Pin diameter: .989 (included). 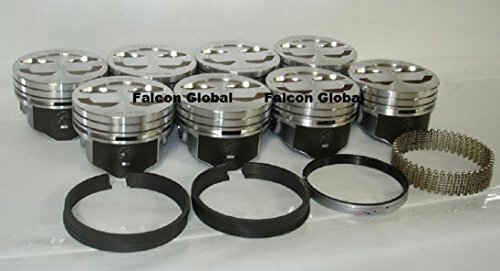 This listing is for a set of (8) Pistons for 1966-74 Ford 360 cid 390cid FE-series - 4.050" Standard Bore Size car & truck engines. Flat head w/4-valve reliefs, 5/64" 5/32" 3/16" ring grooves, .9751" pin diam. 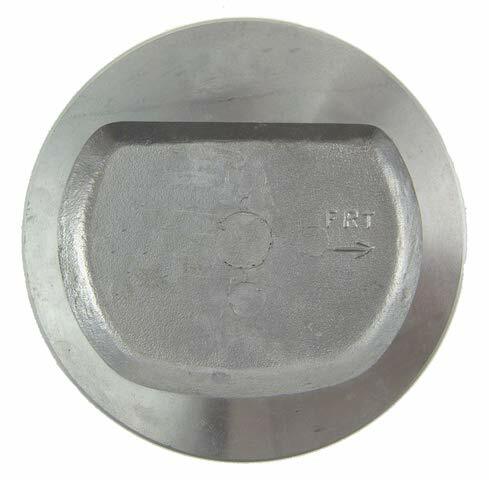 - pins included, for stock length connecting rods and Floating or press-fit Pins. 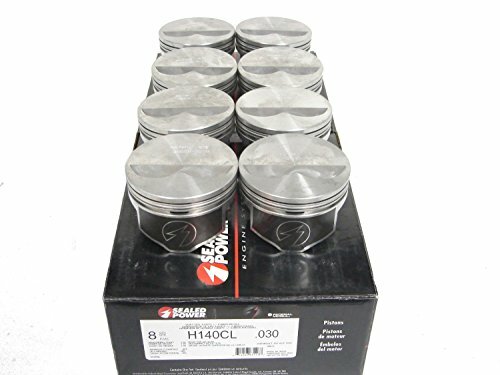 Bore: 4.050" (at STANDARD); Piston Style: Flat head with 4-valve reliefs; Comp Distance: 1.759"
This listing is for a set of (8) Speed Pro Hypereutectic Pistons with either Perfect Circle or Hastings Moly Rings Kit. Small Block Chevy 350. .275" Dome with Two Valve Reliefs. 5/64" x 5/64" x 3/16" Rings Press-Fit or Floating. 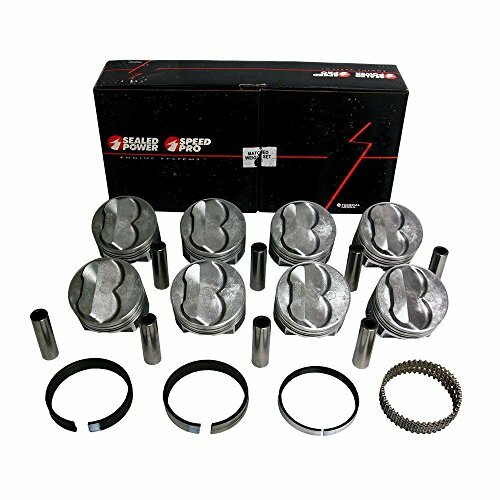 This set is for 4.030" Bore Size. Small Block 350 4.030" Bore Flat Top-2 Valve for 6.0" Rods Can be press iftted or Floated. Cones with Lock Rings. NOTE:Rings package is 1/16" 1/16" 1/8". This listing is for a set of (8) Speed Pro Hypereutectic .030" Over Size Pistons and Matching Moly Rings( Perfect Circle/Hastings) H616CP 30 Kit. Fits Small Block Chevy 400 & Rod Length: 5.7". Flat Top, Four Valve Reliefs, Hypereutectic Aluminum, Press-Fit or Floating, 5/64" x 5/64" x 3/16" Ring package.4.155" Bore Diameter. This listing is for a set of (8) Speed Pro Hypereutectic COATED Pistons & matching Moly Rings for Chevy 400 in Your choice of sizes. Dish top with 4-valve reliefs - .135" deep (-12.5cc) and Perfect Circle Rings. Good for street/strip or light race. Must use with 5.70" length connecting rods. 3.750" stroke PRESS or FLOAT. 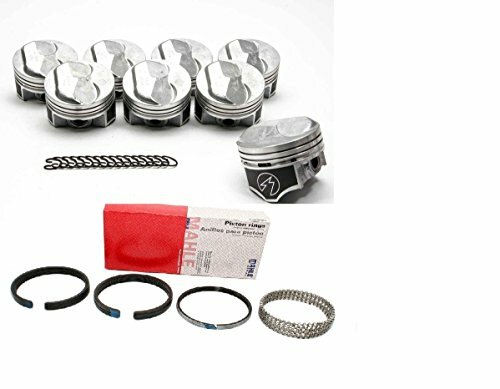 This listing is for a set of (8)Speed Pro Hypereutectic Pistons with Perfect Circle or Hastings Moly Rings Kit. Small Block Chevy 350. .275 Dome with Two Valve . This set is for Standard 4.00" Bore Size. Press-Fit or Floating Pins included. This Listing is for a MERCRUISER 5.7L V-8 FLAT TOP HYPEREUTECTIC PISTON+RING KIT 255hp 260hp 270hp 280hp 300hp MIE Mag Alpha. 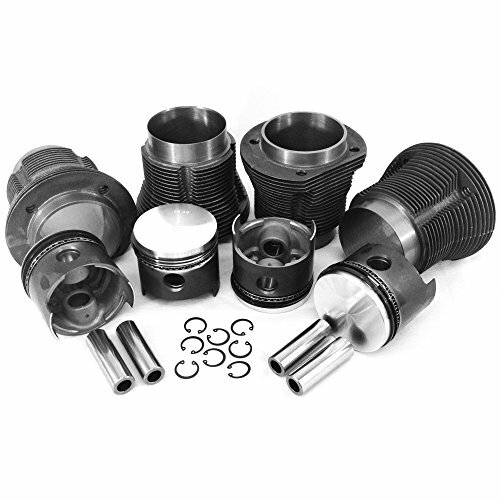 This listing is for a set of eight (8) 4.00" Bore (at Std) Sealed Power FLAT top pistons and a MOLY piston ring set (Hastings/Perfect Circle/MAHLE) for Mercruiser 350ci/5.7L applications using the Chevrolet V-8 engine. BRAND NEW FACTORY MATCHED Set of 8 with Clips, Pins & Rings. MAHLE Pistons with Coated Skirts & Premium MAHLE Rings Pre-Installed Why waste money on some no-name Asian knock-off brand piston when you can have real MAHLE OEM Quality, with coated Skirts for near the same price?? 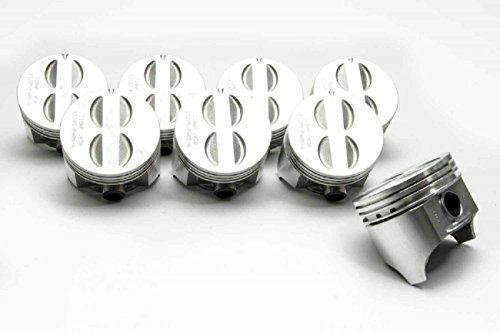 FITS: All Ford 6.0L V8 Turbo DIESEL Engines 2004-2010 VIN code: P (8th character of VIN#) These Pistons fit all 6.0L diesel Applications including all: 2004-2010 6.0L Pickup Trucks, Cutaway & Van Applications THIS LISTING IS FOR STANDARD SIZE PISTONS with Coated Skirts to Reduce Piston Slap, Side-wall Scuffing and Friction IF YOU NEED A DIFFERENT SIZE PLEASE LET US KNOW. 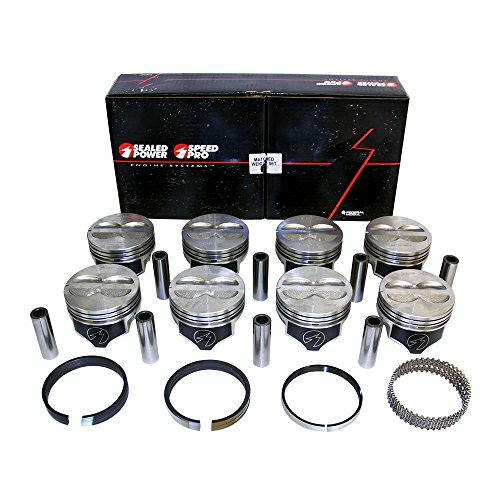 This is a complete set of 8 Pistons with Clips, Wrist Pins & Pre-Installed Premium MAHLE Rings, featuring a Keystone Style Top Ring for Maximum Compression Retention. MAHLE Pistons 1. Ni-resist top grooves to control groove wear. 2. Balanced Set of 6 for smooth engine operation. 3. 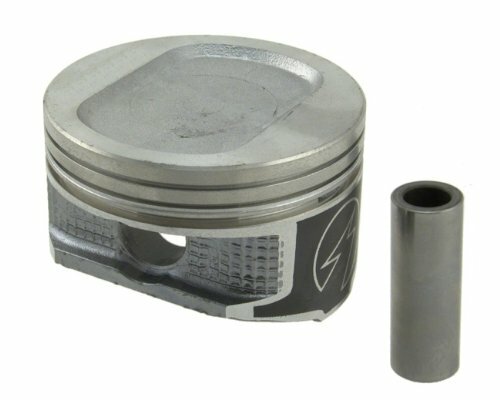 The M124 Piston material (used in these pistons) is a highly evolved "Eutectic" material, which contains approximately 12% silicon for excellent strength and excellent thermal expansion properties. For diesel engines, the Eutectic material is chosen over Hypereutectic material because it bonds better with the ring land or ring groove inserts used to strengthen and better support the piston rings in high performance/ high load diesel applications. The Eutectic material with MAHLE's ring groove inserts make a better piston than a forged material which does not hold the insert very well. MAHLE uses Eutectic material so they can install high strength ring-land inserts into the piston grooves for longer life. MAHLE Piston Pins 1. High strength steels meet structural requirements to prevent pin breakage or deflection. 2. Case hardened to provide long lasting wear surfaces. 3. A high degree of dimensional and surface finish control are the final requirements for strength and long life. 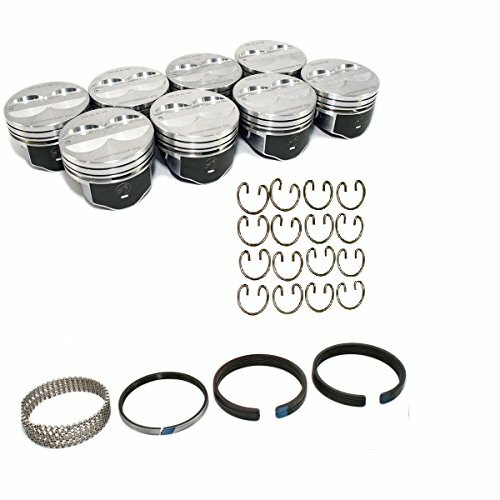 Jeep Cherokee/Wagoneer 4.0 4.0L 242 Sealed Power Hypereutectic Coated Skirt Piston Set/6 1996-2006 +.020"
If you're looking for pistons with an unbeatable combination of performance and value, then Speed-Pro hypereutectic pistons are for you. These pistons are manufactured from FM244 aluminum alloy, which contains 16 percent silicon for greater strength and wear resistance. They're also molded in the latest permanent-mold technology to ensure the precise fit and tight bore clearances that today's top engine builders demand. They're ideal for use in high performance street, bracket racing, and oval track racing and will work perfectly with normal ring end gaps.